In my last blog, Looking Back, I was reminiscing about the time of preparing to move to Ukraine. In this blog, I will be looking back at my first year in Ukraine. Our family arrived in Krivoy Rog on June 13th. After leaving America June 1st, we spent some time in Kiev and then in Turkey at a retreat for the other people from our organization in our area. While there, Denise and I enjoyed a Turkish bath and massage, but the retreat was what we needed after the stressful month of May. I was very hot and tired, but it was so nice to be welcomed with a surprise supper, including a cake (with lit candles) for dessert. There were signs in our temporary home welcoming us to Krivoy Rog. Our friends here were so glad that we come I felt blessed and loved. We had finally reached our destination! Our first big shopping experience was overwhelming! We had bought a few groceries and supplies several times, but this was our first trip to the "big" store (kind of like Super Walmart with a lot of liquor). When we were done shopping, I paid cash for our purchases - more than 1,700 grivna, How could it be that much? What a shock! Then I remembered to divide by 8 (because there are about 8 grivna to the dollar) and realized we only spent a little over $200. No reason to panic. To shop, it really helps to understand at least the numbers in Russian. You can get by with having them show you the calculator (except for one shop near us that still uses an abacus). In the little stores near the apartment building, it is necessary to ask for things by name because they are behind the counter or in the back room. It's like going to the store on Little House on the Prairie or Anne of Green Gables. This means it is very helpful to know the Russian word for what you are looking for (prevents having to point and have the clerk guess). At first, bringing my English-Russian dictionary to the store with me brought giggles from the clerks, but I always got what I wanted that way. Even still, it can be challenging when I know the right word, but I pronounce it incorrectly. Then the clerk looks at me like I was speaking another language - only one that neither of us knows. To communicate, I have found that much can be said even without words, but with my limited Russian (especially at first) it was always very helpful to have someone around who knew a little English. The more Russian I have learned, the more I realize that there is left to learn. I am making progress, though in some situations I do not feel like it. Some people talk so fast (sounds like me in English) and, if I can, I ask them to slow down. Sometimes I try to fake it, but usually get caught. The biggest challenge I find is vocabulary. I know a lot of words, but people do not stick to my "known" vocabulary list. They use words I do not know - or a form of a word that I have never heard before - or a word that I have completely forgotten. It is a continual learning process, but I am keeping at it! To build relationships, we have to spend time with people. One of the easiest ways is to play something and ping pong has become that thing for me. I am good enough that I do not lose all the time (and bad enough that I do not win all the time either). It has been a way to connect with several young men, who I have had a lot of fun with. I even went swimming in the dirty river with a few of them just because I wanted to spend time with them. Some days I have had to let them know that I do not understand...so many times in one visit that they would laugh at me. Oh, well. I'm glad I could make their lives more pleasurable. :-) I have also met a few guys on the train who I still keep in touch with. I am just trying to be friends with whoever God brings into my path. To share at church, it is important to be able to speak Russian for myself. So I have worked hard at learning Russian so I can speak there. I have shared several times in Russian during the last year and try to do so almost every time before I sing a song, but none was as painful as my experience in late July. We had been here less than two months and I knew precious little about Russian. Anya helped me get through the things I was trying to share. Quite honestly, while it was painful (for me and for those listening), it was a good thing because it demonstrated to them that I was trying to learn and it helped to motivate me to learn. Since then, I've had some ups and downs with my Russian speaking experiences, but it is getting much better. I am thankful for God's help - as well as Anya's encouragement and help translating what I am trying to say. Pastor Gregori is ready for me to preach in Russian, and while I'm getting close, I'm not quite there yet. I am currently working on some short things to share at church sometime soon - call to worship and offering short "sermons." To minister in the village, it helps to be American. Most people here like Americans and are very interested in meeting one. One older lady told a friend of mine who was here last November, "I never thought I'd ever meet an American, let alone touch one." On my short term trips here, going to the villages has always been a highlight and usually proves to be a unique experience for one reason or another. Since moving here, I have been to a few villages, but I look forward to doing more ministry there in the future. As my Russian skills improve, this will help immensely. At the last village I was at about a month ago, one grandma talked with me a lot. It dd not bother her that I did not always understand what she was saying. I think she thought it was pretty neat to be able to talk to an American. Her granddaughter picked a bouquet of flowers for me (picture) when we walked by the river after the service. It was a beatiful spring day that day and I thoroughly enjoyed the time we spent in that village. To go to an orphange, you just need to be able to love on kids. I went to a boarding school/orphange one Friday afternoon, while my family was still in America, with Adam and Curtis Nikkel (two brothers from Canada that lead an Orphanage ministry here). My plan was to visit one time, but God had other plans. One young man who knew some English asked me several times if I was coming back tomorrow. I answered "I don't know" because I honestly had not planned on coming back. When I left, he said "See you soon" and I knew I would have to return. Being able to speak Russian helps, but most of the boys do not care what language I speak. One boy taught me to play chess while he spoke as fast as he could in Russian and used a lot of hand gestures. The hugs that I get from them because they are glad to see me means so much. Some of the boys love to roughhouse, so it has been fun (and tiring) horsing around with them. There are several boys that I could take home in a heartbeat. It is so hard to seem them living there without parents. Since I cannot take them home, I will do what I can to love on them. And many of them are willing to correct my language mistakes, which is very helpful. I enjoy the many aspects of ministry that we are involved with, but going to the orphanage and villages are definitely highlights for me. Many days I wish I could speak Russian so much better than I can. This week I am reading from Zechariah. Today was chapter 4 and I read verse 6, which is familiar to most people in the Assemblies of God. It says "It is not by force nor by strength, but my my Spirit, says the Lord of Heaven's Armies" (NLT). Only the Holy Spirit can help me. In my weakness, He makes me strong. In spite of my lack of language skills, God is still able to use me. As I continued reading, verse 10 really challenged me. "Do not despise these small beginnings, for the Lord rejoices to see the work begin" (NLT). As I look back on the last year, do I look down on the small things that have happenned, or do I rejoice because they are solid foundation for the future. My ability (or inability) to speak Russian has a direct impact on just about everything that I do (or want to do) here. There are very few settings that English will help me at all in our city, so there are plenty of reasons for me to learn the language. Am I hard on myself when I should be rejoicing in what I do know and in the successes that I do have? I am the type of person who is harder on myself than anyone else can be, so I tend to look at the flaws rather than the successes. What I need to do is say "Wow, look how far I have come" instead of "I said 'idiot' instead of 'go' this morning. This is so hard." (Yes, I did that. And I mispronounced their word for Easter. Thankfully, I am not bothered much by these "public" mistakes.) Thank God that He is helping me make progress. Am I looking back at the last year thinking that I have been a failure because of one reason or another? Or am I thanking God for the work that is beginning, knowing that it will continue to get better as I apply myself. There is no doubt in my mind that I am where I belong at this time. Looking forward, I am excited about the years of ministry ahead. The foundations we build today will reap benefits in the future. That is why God rejoices to see the work begun, because He knows what lies ahead. What about you? Do you look at the few, little things that you may be doing with dismay, wondering when you will get to do something big? Be faithful in the little things and you will be given more and bigger things to do. Trust me, it is true! We are coming up on the one year anniversary of leaving America and moving to Ukraine. Maybe you are not nostalgic, but on certain anniversaries, I find myself reminiscing about events of that past. Sometimes the memories bring sorrow, like the anniversary of the death of a loved one. Sometimes the memories bring great joy, like the celebration of a birthday or a wedding. As I look back one year, I remember how stressful, how busy, how full, and how challenging life was during our last month in America. The days were exciting, as we looked to what lay ahead of us, and sad, as we said good-bye to our family and friends. There was so much change taking place in a very short amount of time that we were unable to process all of it. We just went through it, almost in a daze sometimes. Maybe that was a good thing. Just two days later, we closed on the sale of our home - the 3300+ square foot house that we bought in 2005 to be our retirement home. In my mind, I planned to retire from Federated and we would live in this house "happily everafter." Those who know us will tell you that we had plenty of "stuff" in that house. The sale of our home was the main thing that kept us in America for longer than we would have planned. But, in the end, God's timing is always better than ours. Even though we had been preparing for leaving the house for a long time, there was still much that needed to be taken care of in the end. Thankfully, some other homeschool Mom's came and helped us clean the house. That meant so much to us, as we would not have had enough time to do everything we did and that to. Even before our organization approved our application, we had started the process to get rid of our things. As time went on, that task became easier. They were only things, after all. We had many garage sales so we could make some money on the saleable items - and we had those sales in three different cities. Yes, garage sales are a lot of work, but when you are raising money, every penny helps get you closer to your goal of moving to the field. Thankfully, our house was a great location for garage sales. The last few days before we moved out, we were trying to give away things that anyone might be able to use. People from our church came and hauled away more than a pickup truck loaded with more things for a church garage sale, most of which had not tried to sell already (anything leftover normally went to Salvation Army after the sale). Words cannot express what it meant to have people in our lives willing to help us out. 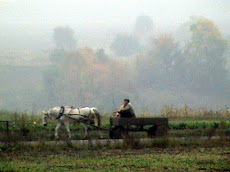 My first trip to Ukraine in 2006 was great. After returning home, I became quite certain that things were going to be changing in our world. Even though I loved my job, during that trip something came alive in me that I had never experienced before. I knew that if we stayed where we were, in the end I would be miserable and unhappy. Returning to Ukraine in 2007 only confirmed that. Denise joined me for the 2008 trip. While we were here, I kept asking her if she could live in Ukraine. (Her answer was always the same - yes!) We were well on our way to moving here when I came back in 2009. With each return trip, I noticed changes in myself. The changes were in preparation for this major change. With any major change, we all know that there is a lot of work involved! Sometimes those changes are inside of us. Looking back, I am 100% confident that moving to Owatonna in 1996 to work at Federated was the right thing to do. I am also 100% confident that moving to Ukraine last June was the right thing to do. I have no regrets. Zero. I loved my job then. I love what I do now even more than that. Yes, I do miss some of the people back home - especially family, good friends, and some of my coworkers. I am so grateful that we live in the age of technology so that we can keep in touch with people back home so easily. E-mail, Facebook, and Skype are a huge blessing! In the end, my prayer is that more people will live "happily ever after" because we were willing to step out and move to Ukraine. That is the heartbeat of God - going to those who need Him! I can look back without regret. I can look ahead without fear, even without knowing the things that are ahead of us. After all, we have faced many challenges and have persevered. I can face each new day knowing that my heavenly Father has a special plan and purpose for me - and I am fulfilling it at this time and in this place. What about you? Do you live with regrets over past decisions - whether made by choice or by default? Are you doing (or working towards doing) something you have always wanted to do? We have had some trouble with our electricity off and on since December. The main breaker would occasionally go off at random times. We were not sure why and, as a result, were more unsure of a potential solution. One of us (usually me because Denise could not reach the breaker) would just go and turn the breaker back on. After a minute or so, our Internet router was restarted, and we were back online again. (That's one of our most important pieces of electrical equipment here, don't you know?) Sometimes we would turn off the washing machine for a while "just in case" that was the problem. It could go off a couple of times in one day or we could go for a couple of weeks and have no problems. We would think, "Oh, good. Maybe that's behind us." But the problem kept coming back. Yes, it was a nuisance, but we learned to live with it. A couple of weeks ago, the electricity starting going off many times in a day and even overnight, when we were using very little electricity. I would get up to turn it back on several times before I went to sleep and again early in the morning before I wanted to be awake. Some of the people who could have helped us were very busy at this time, so even though we wanted and needed help, it did not look promising. Why hadn't we pursued a solution earlier? Maybe were afraid of what others might think? After a week of this, I was really getting frustrated - and irritated. During lunch time one day, it went off - AGAIN! So I got up and turned it back on. Before I even sat back down, it went off again. This happened several times. We had to do something. NOW! We do not have many connections for this sort of thing here, so here we "phone a friend" when we need help. (Side note - what a blessing friends can be! Am I there to help out when my friends need me?) He knew someone who could help us, but because of the holiday, he could not help for four days. I did not think I could take another hour of this, let alone days. There was another option, so he made another call. Someone could come today to help us out. As we waited, and the breaker went off several more times, Laura told me to go for a walk. When I asked why, she reminded me that there were no breakers outside to go off (and frustrate me!). I listened. I'm glad I did. Very shortly after I got back from my walk, someone was here to help us out. He took one look and said "Oh, I see. That is very, very bad." He had the right parts with him and within ten minutes, our problem was fixed. That is how life goes. Life goes along quite smoothly when, all of a sudden, we are face to face with one of life's challenges. Where did that come from? We make it through and are glad when it is over. Another challenge hits us. And another. Many times, those things are completely out of our control, but sometimes we need to do a better job of looking over and maintaining the things around us. Why do some people walk around the car and check the tires or check the oil before they go anywhere? Probably because they have learned that knowing about a possible problem is better than trying to fix it after you've driven on a flat tire or without enough oil. An ounce of prevention is worth a pound of cure, "they" say. I'm really not much of a car person (they are a necessary evil - though one we are living just fine without right now), but here's another example. We know that tire on our car needs to be replaced, but maybe we can get a few more miles out of it. When you have a flat tire at an inconvenient time or place, should you really be frustrated? You gambled and lost. (Just for the record - I believe gambling is bad. Sometimes I choose to gamble things like this, even though I would never go into a casino. I need to be reminded of what I just said - gambling is bad.) It would have been so much easier for everyone if you had taken care of that tire when it was more convenient. Right? Has anything like that ever happened to you? Do we have things "going off" in our lives, just like our electricity did? We get irritated because they are an inconvenience. They mess with our schedule or our plans. Sometimes they are a warning that we need to change or fix something. Do we look, listen, and make a change - or do we just go on being irritated? What was the problem? Our breaker was going bad and was getting burned out. We saw some of the signs of burn marks by the wires, but it had always been that way. Maybe that is normal here? I guess not. The solution was to replace the breaker. From the moment it was turned on, replacing the bad one, we have had no electrical outages. Zero! Tell me again why we didn't take care of that sooner? The other day I was thinking (it happens once in a while!). What things have I let into my life that I should be dealing with now - before they are a bigger problem? What should I change now when it is easier, rather than later when it is much less "convenient?" Lord, help me be more observant and fix the things that I can. There is a lot of wisdom in the serenity prayer, isn't there? Do you have irritations that you choose to live with instead of changing?